Peg and Pog and Glenda send a special Valentine wish to all lovers. February 14 is the traditional day for sending a Valentine wish to your sweetheart. Until Pog met Peg he had not experienced anything particularly exciting or dangerous. Break dancing, although being somewhat exciting and dangerous, had not had any romantic effects on Pog. Of course break dancing on his own, in private, did not set Pog up for any likely romantic experiences. Peg and Pog stars of Dolls are Different, or are they? Peg captures the very essence of romance in the language of love as only she knows how. Can Pog say ‘no’ to the angelic vision of Peg as he regains consciousness (among the roses)? Of course, the only response he can offer is that of a gentleman, “Yes, thank you very much.” Pog feels an overwhelming urge of love for the angel who appears before him. Such sensitivity! Such insight! The wonder and mystery that overtakes Peg and Pog must be romance. Feelings of ecstasy, unconditional love and joy as two souls reach out to each other and meld together in harmony! What Peg actually says to Pog is not important. For Pog, the message is clear and he is excited. That is all that matters. The language of love is indeed powerful and potent. It sweeps all concerns away and, as Pog finds out, it can snap a bloke from a dazed state to full alertness in a moment! Glenda J Ashleigh, Brisbane Celebrant weds the delightful love ducks in a ‘first’ for Brisbane. Brisbane ducks will never be the same! 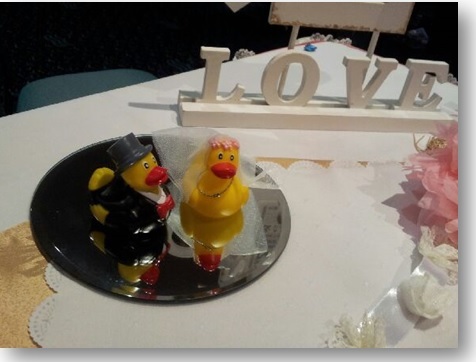 These ‘luvducks’ will say ‘I do’ in the beautiful Brisbane Bayside suburb of Manly. Brisbane ducks will gather to witness the Bride & Groom being joined for evermore in duck love. The wedding pond is a romantic wedding venue where the Bride & Groom first found love. The Bride & Groom will display their love with a large ‘Love’ sign. Brisbane Celebrant, Glenda Ashleigh is very good at guiding nervous Brides & Grooms (including ducks) through their romantic wedding vows. There will be much ‘happy flapping’ when the Groom gives the Bride an affectionate peck at the end of the ceremony. Duck family and friends are delighted that the two ‘luvducks’ will be wed in Brisbane’s Beautiful Bayside. The Wynnum-Manly-Lota area on Moreton Bay has many great venues for wedding ceremonies all year round. This suits ducks just fine as the water is never far away. Lovely sea breezes during summer days allow ducks to relax and enjoy themselves. Winter days by the bay are a duck’s delight with sunshine glinting on the water. Brisbane Celebrant Glenda Ashleigh is Brisbane’s Really Good Celebrant. People (and ducks) find Glenda friendly and approachable. Glenda is a true professional, reliable and trustworthy. Your ceremony is Glenda’s business and she takes very good care of it. What does Glenda do very well? She really listens to Brides & Grooms. Your wishes come first! You can be confident that Glenda will help you plan the ceremony that best suits you. The Wynnum-Manly-Lota area is easy to get to from the Brisbane CBD. It is close to the Gateway Motorway, linking the northern and southern areas of Brisbane. Contact Glenda by telephone or email for a free chat about your ceremony wishes, needs and wants. Glenda will answer your questions clearly and honestly. You are welcome to arrange a meeting with Glenda, obligation-free to discuss your ceremony. Love blooms for Peg & Pog. 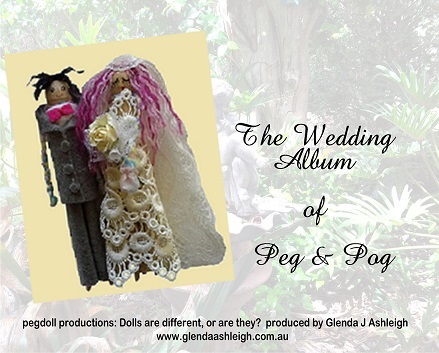 Peg & Pog feature in the micro-series “Dolls are Different, or are they?” which follows the fortunes of all involved in planning a peg doll wedding. This delightful micro-series that will enchant all those who are young at heart and all those who wish to be! Peg & Pog have their own language of love, and helped (or hindered?) 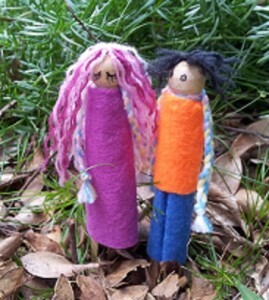 by various members of their families, they embark on the uncertain journey of planning a peg doll wedding. Peg & Pog ‘discover’ each other in the local park. Peg and her little, 8-year-old brother, DP, take a walk in the park. The sun is shining, and Peg stops to smell the roses while DP decides to … well, that would be giving the story away! It is enough to say that there is action, drama, pathos and happy endings. Peg is a girl who knows love when she sees it! She is kind, considerate and quick off the mark. Pog is a boy who also knows love when he sees it! He is kind, considerate and quick off the mark (and handsome, talented, etc, etc). Does Peg really know what love is all about? How can Peg tell what true love actually feels like? Does Peg expect too much? What does Peg really want the love of her life to do for her? Does Pog really know what love is all about? How does Pog know what the language of love actually sounds like? Does Pog expect enough? Is love enough? What does Pog expect of love and life? These questions and many more occupy the thoughts of the little lovers as they meet, ‘fall’ in love and start to plan their wedding. You are sure to identify some of the situations, reactions, character profiles, personality traits that are present in your family or in families that you know. After all, dolls are different, or are they?